Is this a true Audi experience? It all started when I wanted to do a comparison between my last review of the Super Fancy GoGet Audi A3 and the Hertz 24/7 Audi A3 — the well-needed replacement for the BMW 118i in their on-demand fleet. The booking was for 8am on Sunday morning for 24 hours. My wife and I planed to visit my sister and her partner in Newcastle, roughly a 300Km round trip from Sydney. 7:00am – phone rings. It’s a Melbourne number and it’s the first day of daylight savings (i.e. it’s 6:00am in my brain). Hello Mr Heslin, we note that you have booked the Audi A3 this morning at 8am and it appears the car is still in Gosford (90 minutes away) and the current driver doesn’t seem to be answering their phone. The nearest vehicle we have available is a one-tonne ute. 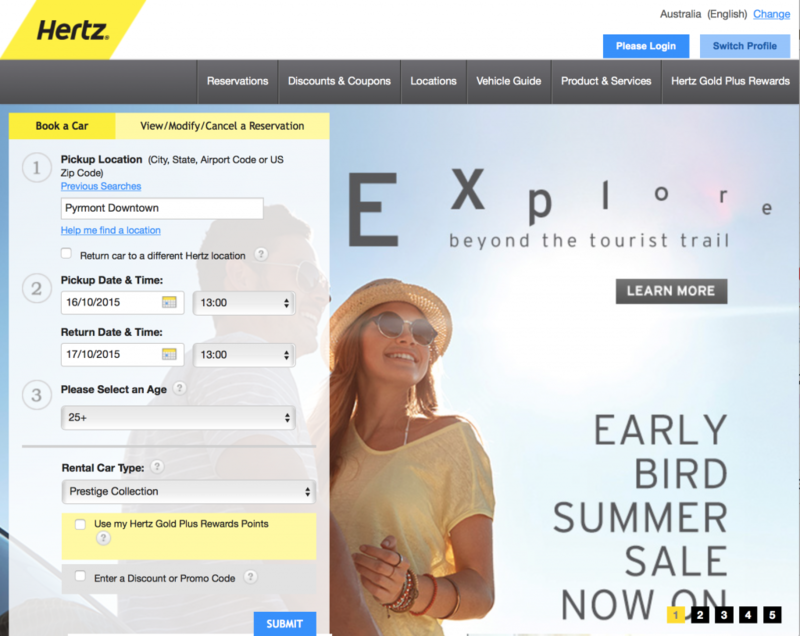 I planned to write a review about the Hertz 24/7 as a direct competitor for GoGet’s on-demand car rental service. Aptly, this site is about prestige rentals, not ute rentals. Sigh. Looks like taking my chance with the Hertz Economy Prestige was the next best option. 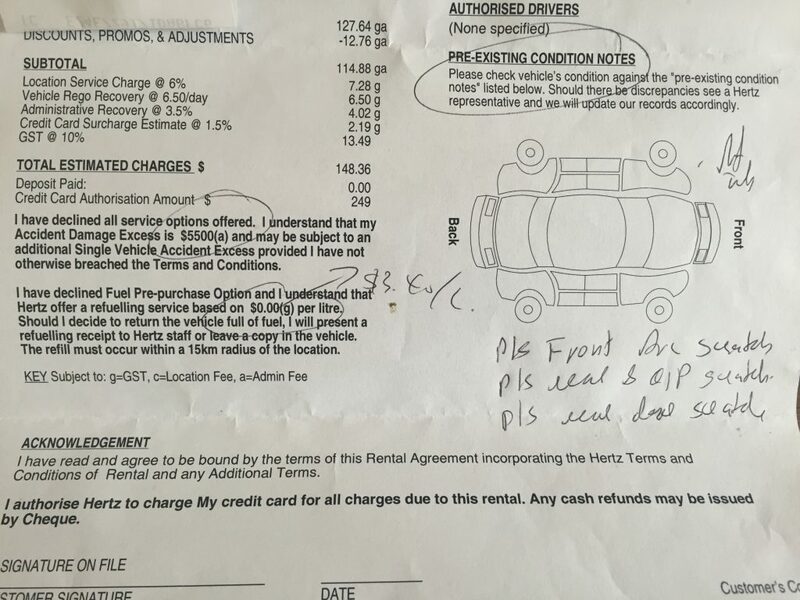 Hertz 24/7 called back and I asked to cancel the booking. She mentioned that if I was booking for three or more days with Hertz (the full-service rental), then I would be entitled to a 20% discount. Nice to note for later. I ended up driving 470Km on the trip so I definitely chose the right option for this journey. The closest Hertz to my home is in Darling Harbour (Sydney). For anyone who takes the Anzac Bridge into the city, this will be your closest also. However when I called to book they told me all cars were out for the day (yes, it was a public holiday weekend) and it would be best to try the city branch, just east of Hyde Park towards Kings Cross. Okay, let’s try that. As I’m an Etihad Guest Gold member, I used my CDP number to score a 15% discount. For 24 hours, unlimited Km in their Economy Prestige class it cost me $148.36 total. Despite being about 50% more than the Hertz 24/7 car AND I would have to pay for fuel, at least I had a car for the day and something to write about. In retrospect, I paid more than I have paid before for the same class in previous rentals, it may have been because of the long weekend. I’ll explore this pricing in a later article. Passing by the flocks of police with their double-demerit RBTs, I rode my motorcycle over to the Hertz on William Street in the city. Being a hot Sunday morning of a long weekend, traffic was kind to me. One of the great things about this particular Hertz (or any rental outlet nearby) is that they have plenty of motorcycle parking, meaning no nasty fines whilst I’m renting a car. The Hertz admin office was full of tourists. Luckily I am registered as a Hertz Gold member so my line only had the couple being served. The lady behind the counter politely excused herself from her customers to ask if I was a Gold member. I’m glad they are keeping the priority queue a priority. Insurance – $25 to reduce the excess from $5,500 to $1,250. Tolls – $16 per day unlimited tolls or $16 admin fee per toll if you don’t choose this option. (They also don’t mention you can just call the toll company and pay that particular trip). Fuel – pre-pay for your fuel so you bring it back empty(ish) and they will take care of it at an agreed rate, which is supposed to be less than the pump price. If you don’t accept this offer and don’t fill it before returning they will charge you $3.40 per litre! I declined each of these – with good reason too. More on this later. As you might have guessed by now, the car allocated to me was an Audi A3 with about 4400Km on the clock. 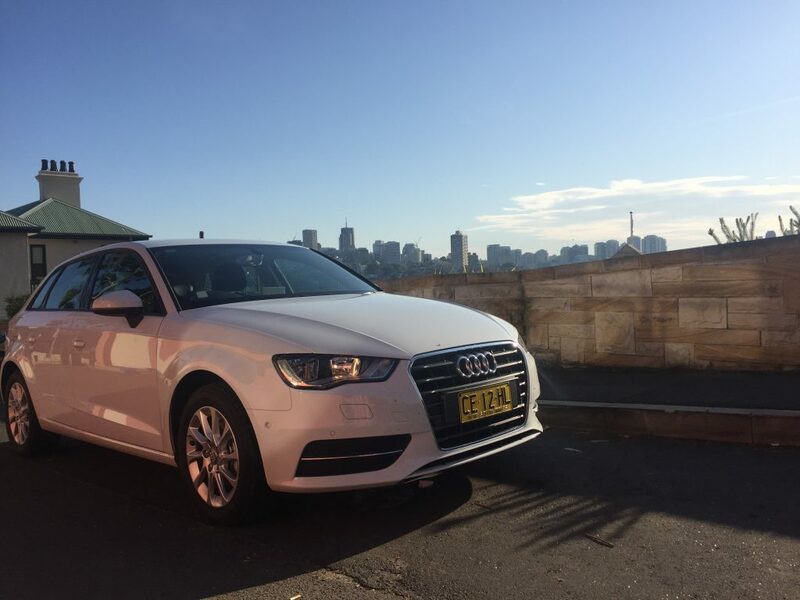 Little did I know how different this would be the GoGet Audi A3 reviewed here. Maybe it was that I made my booking 30 minutes before starting, maybe it was because it was a long weekend, either way I had to wait another 20 minutes after my 8am pickup time before I drove away. All of the car attendants were running around with other customers so I found the car that matched my number plate and started to check for damage. The problem was that the car was so darn dirty – bugs and dirt everywhere. When I got the attention of the attendant I requested for them to wash the car before I take it. He said it would take 10 more minutes – fine with me for a clean car I could inspect properly. After the washing process was done, I did a thorough inspection of the car with close attention to any rim damage, window damage and long scrapes on the front and sides below the doors. I’ve previously been caught out with Hertz where the car (a BMW 118i with $5000 excess) was free of damage but there was a huge dent and scrape (not scratch) under the driver-side front and rear doors where someone had presumably mounted a curb in a carpark. That’s a story for another time. I found three small scratches on the paintwork. They were notable enough that if it was my car I would be pissed off, so I pointed them out. The attendant told me that they don’t do damage inspections anymore and it’s only for the large scrapes and dents they care about. I told him I would like him to write it on the damage report anyway. He did. Use the damage report in your favour. Have them write a few things on there that aren’t noted when you pick up the car. Why? Two reasons. Firstly, you proved that they didn’t pick this up upon the last person returning the car. Secondly, the chart is so undetailed that if you accidentally scratched the car in the same place that there was another scratch that was marked, you would get out of paying for any damage. After taking the keys I decided to do something I don’t normally do, however as I knew that I was writing this review I decided to go straight to the petrol station and fill up to see if the car was given to me really full. It turns out I could get 3.33L into the tank, which was about $4.66 that I had to pay for the last person’s rental. To be fair – I don’t care. However I would suggest you do the same because if it’s over 5 or 6 litres, this is another 100Km you’re paying for. Call them up immediately and take your receipt when you take the car back. Let’s get into the details of the car. Although this was the exact same model as the GoGet Audi A3 I previously reviewed, there are some subtle differences that make these cars quite different to drive. Here is how they compare. The engine, gearbox and mechanicals were exactly the same. Driving with four adults really shows how these 1.4L engines lack torque. It’s fun with one person, two has a little lag and the extra weight of three or more adults really bogs down the engine till you’re revving hard. I was wondering if the details in my last review were incorrect, that I had the 1.8L in the GoGet model and this was a 1.4L. However after checking the VIN plate, they have the exact same engine codes. It all comes down to weight and torque. Speaking of torque, I noted that when in Sports mode you will see gear shifts at 4,000rpm but if you have your foot down hard it will shift at the redline of 6000rpm. The primary difference between these two A3s is that they have different upgrade packs added to the base model ‘Attraction’ series. The GoGet Audi A3 came with the $2000 Attraction Style Pack, including Xenon headlights and 17” alloy wheels, where this Hertz Audi A3 had the $2990 Technik Pack which gives us navigation, a coloured driving display, front/rear parking sensors, a reversing camera, and the ‘Audi sound system’ with subwoofer. If the underlying car is essentially the same, the big question is how do the packs compare? In my opinion, these packs have been suitably chosen for the type of driving you would typically be doing in the GoGet vs Hertz Audi. In the GoGet A3, you’ll probably want to have a bit of fun and get around moving from A to B with a touch of class and impress your mother-in-law. Whereas the Hertz A3 is more about longer-term trips (minimum 1 day by default), where you will be travelling to unknown places and could be stuck in the car for lengthy periods of time. The navigation within the Audi A3 is surprisingly good. Compared to it’s competitors in the Mercedes-Benz A-180 and BMW 118i, the Audi navigation system is a clear winner. It’s intuitive, quick and the display is sharp. From a performance perspective, there is a notable performance difference in 16” to 17” wheels. It’s not the rim size you’re noticing, it’s moving from 205/55 to 225/45 rubber. For those who don’t know tyres, this difference in profile from 55 down to 45 reduces the tyre-roll when taking corners or quickly jumping lanes. I didn’t think it would be as noticeable as it really was – the Hertz Audi A3 didn’t really feel so sporty anymore. 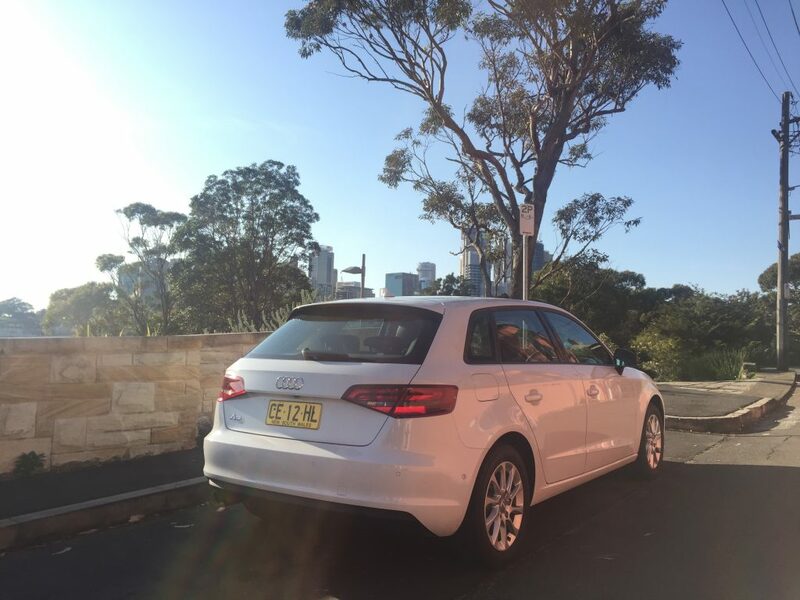 If you want to have some fun in an A3 but don’t intend on driving where you’ll care about audio or navigation, go with the GoGet Audi A3 I reviewed here. On the other hand, the Technik pack adds exactly what you need when you’re going on a long road trip. Parking sensors and the reversing camera are nice, but the standout was the Audi sound system that adds in a subwoofer and one of the best sound systems I’ve heard in any car at this price (under $40k). I would still like a USB input standard but the Bluetooth worked well to punch out our tunes for the trip to and from Newcastle via the Hunter Valley. Overall, everything else was the same as the previous GoGet Audi A3 that I rented from GoGet except this was a May 2015 build instead of December 2014. I suggest you check out my previous review for my thoughts on the car, it’s performance and strong points. I’ve hired the BMW 118i – the other car that could have been allocated to me within this category. The Audi A3 definitely is a better vehicle and I would choose it again if they gave me the option. Up next, the trifecta – Hertz 24/7 Audi A3, a direct competitor to Hertz. Fancy driving the Audi A3?